With multiple drivers, needing room for our “toys”, or just wanting space for storage or tinkering, it makes sense to have a home with multiple garage bays. If you are looking for homes for sale with 3 car garages in Houston County GA, you have come to the right spot. With an abundance of properties to choose from, serious buyers are bound to find the garage space they covet from one of the homes below. These properties come in an array of price points and styles so even choosey buyers will find a home that meets their requirements. Whether you want the extra space for your cars, storage, toys, or something completely different, you will definitely find what you are looking for in the Houston County real estate market. The list below represents every listed property in Houston County GA that has at least a 3 car garage. Happy house hunting! Shopping for a new home can be frustrating, especially when you cannot find exactly what you are seeking. Fortunately, with numerous choices right now, you should have little difficulty searching the homes for sale with 3 car garages in Houston County GA and finding exactly what you are looking for. As a reminder, homes with additional garage bays are typically in high demand. When you find the property that fits your needs, it is wise to make a reasonable offer, or risk losing the property to a more savvy buyer. View all the Houston County homes for sale with parking for 3 or more cars below. Be sure to check out the parking search tips too, then save your favorites and schedule a showing! Consumers who want to know more details about these homes for sale with 3 car garages in Houston County GA or any properties in middle GA, should call me at (478) 960-8055 to find out the specific home details and schedule a viewing. As always, unique Houston County GA properties are provided as a courtesy by your Houston County real estate professional, Anita Clark Realtor. 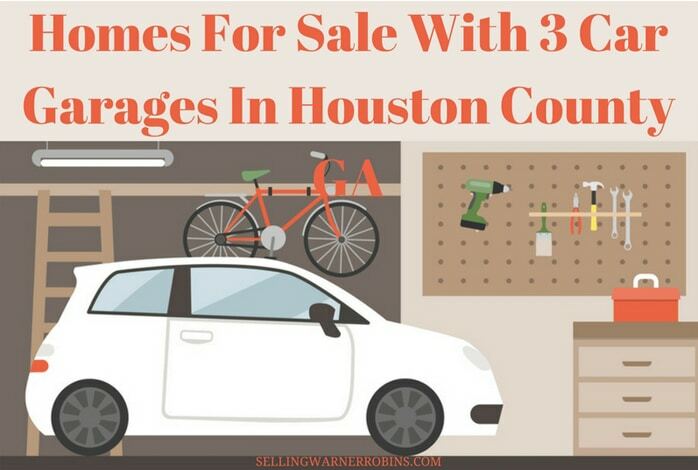 Are You Searching for Homes for Sale with 3 Car Garages in Houston County GA? These properties represent single family homes for sale with 3 car garages in Houston County GA (data from CGMLS) as of the posting date.